I remember my mother wishing there were more hours in the day. So much to do! So little time! Now that I’m a grown-up and a mother, I totally understand what she meant. Our days are filled with many necessary tasks — laundry, dishes, running errands, helping kids with homework. And making meals. As much as I like spending time in the kitchen cooking and baking, I’m always looking for new ways to save time in the process. Anything to hurry dinner along is appreciated by me and my hungry children. We live in a fast paced society and we don’t like to wait for things. Specifically, if you’re my children, you don’t like to wait for your dinner to cook all night. We have the internet at our fingertips giving us this and that instantly with the tap of a screen or press of a button. And it might feel like the drive-thru is the only way to get a fast, hot meal. But happily, it’s possible to make a healthy, wholesome, quick meal while cooking from scratch at home. So this brings me to my 10 Shortcuts for Better Cooking. You may already know some of the tips I’m going to share with you, but even if you do, consider this a nice reminder. And it’s pretty great to have them listed in one place! Let’s begin with one of the first shortcuts I learned even before I got married over 10 years ago. Shortcut #1: Buying chicken in bulk (this could be one big package, or several smaller ones) when it’s on sale is great for saving time, and helps my pocketbook too. Separate the chicken into resealable plastic freezer bags, and take it a step further by adding a marinade to the bag. Note: if you buy your chicken already frozen, this still works! I have a rotating list of favorite marinades, and I spend about 30 minutes after I come home from the store to stir up the marinades and them add to the bags with the chicken. Squeeze out any extra air, then seal the bags and freeze. When you need them for your menu, pull out the bags to thaw. I like to pull one out in the morning and let it thaw in a bowl in the fridge. As the chicken is thawing, it’s also marinating. By dinner time, it’s ready to go! And hey, I mention chicken here, but of course, this same technique works for any meat. Here’s another shortcut I also use on a weekly basis. 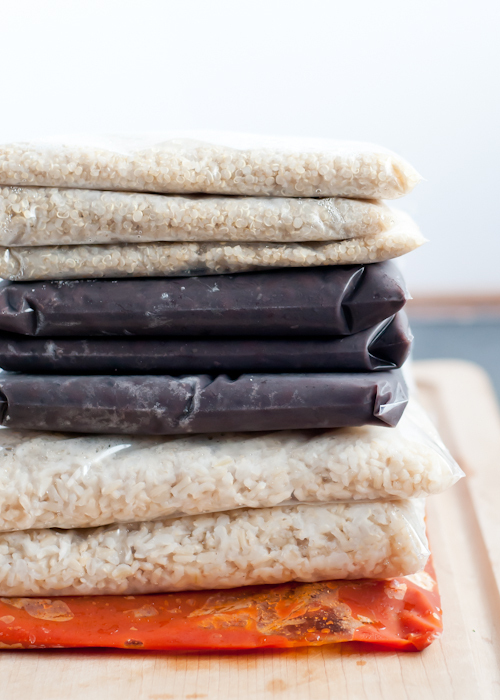 Shortcut #2: Cooking big batches of healthy rice, quinoa, legumes, sauces and soups — and then freezing them in individual, smaller bags. This is so easy to do and great for when I’m in a hurry. If I freeze them flat, they thaw out quickly in a bowl of warm water and are ready to go in a few minutes. Or if I remember to put one in the fridge first thing in the morning, it will thaw out all day. If you think about it, your whole meal could already be cooked, in the freezer, and ready to be thawed out or warmed up. Brings new meaning to freezer meals, doesn’t it? Slow cookers (you didn’t abandon yours, did you? : ) are really good for cooking large batches. I do regular batches of slow cooker black beans and freeze them. We’ll eat some freshly cooked for dinner that night, and then I put the leftovers in resealable bags. 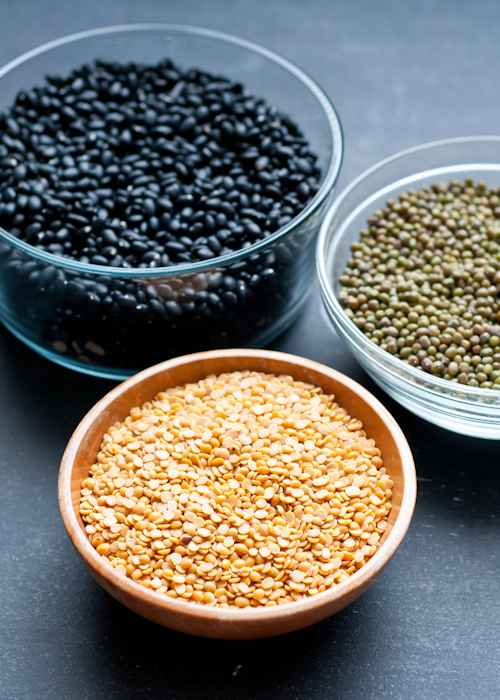 It’s just as easy as opening a can of black beans, but fresher — and cheaper! Shortcut #3: Something I’ve been doing for a little while (and is totally trendy right now!) is to make my own smoothie packs. It makes things infinitely easier for me in the morning if I have a smoothie pack ready to go. Purchase fruit in bulk or on sale and freeze your favorite combinations together in bags. I like to add fresh leafy greens from my CSA to mine, but if you don’t have access to fresh greens, places like Trader Joe’s have frozen spinach and kale that is great to add to your packs. In the morning, put everything in the blender, add some juice, yogurt, water or milk and you’ve got a healthy smoothie for you and the kids. We’ve tackled a few bigger dinner menu items, and helped you about with breakfast, but let’s talk now about the flavor components of recipes. I’ve been known to groan when I’m mid-recipe and notice that what I’m making calls for fresh garlic. One of several things happens: A) I’m out of it, B) I don’t want to take time from what I’m doing to chop one measely clove of garlic, or C) My knives and cutting board are dirty and I don’t want to wash them. Okay, B and C are pure laziness, but still. Peel the garlic and simply chop a few heads in a food processor or put them through a garlic press, put in a jar and top with olive oil. Much better than the store bought! You could do this once a week or every other week depending on how often you cook with garlic. If you’ve planned your menu ahead of time, then you’ll even know how much you’ll need for the week and can prep accordingly. You can even add herbs to the garlic, which leads me to the next shortcut. 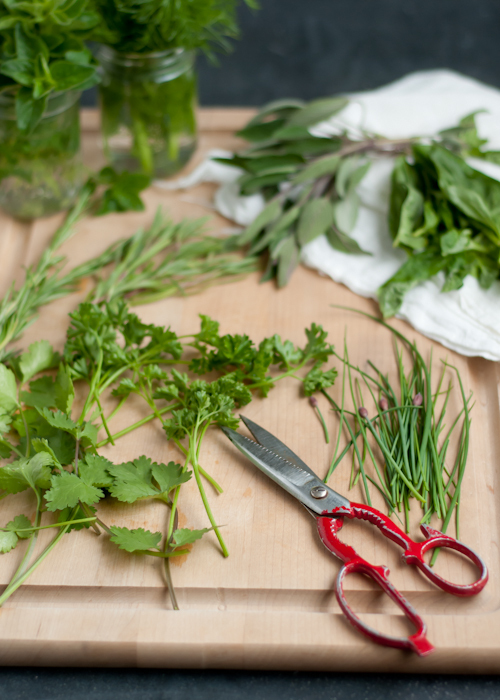 Shortcut #5: Chop fresh herbs, top with olive oil and freeze in ice cube trays. Brilliant, right? Maybe you’ve seen that kicking around Pinterest. It’s such a great, time-saving idea! The cubes can be tossed into sauces and soups. Or put one or two on hot cooked pasta. Or toss a couple in with rice while it’s cooking. Fresh herbs really add a lot of flavor, but sometimes they might wilt before you can use them all. This is the perfect solution. Ice cube trays also come in handy for our next two secrets. For times when you only need a little wine in a recipe or maybe you’ve made a killer sangria and you don’t want to water it down, use the frozen wine cubes. Shortcut #7: Store-bought bottled ginger doesn’t taste as good to me as fresh, but along with chopping garlic, grating ginger is one of my least favorite kitchen prep tasks. The answer is very similar to the garlic, except that instead of a jar, I’m using my handy ice cube trays again. This keeps the ginger much fresher. Simply grate it (I used my grating disk for my food processor) and place tablespoon-sized spoonfuls in the wells and freeze. Pop them out and put them in a resealable bag. My next shortcut involves butter and a cheese grater. I learned this tip from my husband’s cousin as he had a sudden craving for lemon bars. Shortcut #8: He grated cold butter into the dry ingredients and the crust was ready in a flash. No pastry cutter needed, which is a kitchen tool not everyone has on hand. Bonus: This also works for pie crust or if you want to quickly soften butter for cookies or cakes without using the microwave. Shortcut #9: Kitchen shears are one of my all time favorite time-saving kitchen tools. 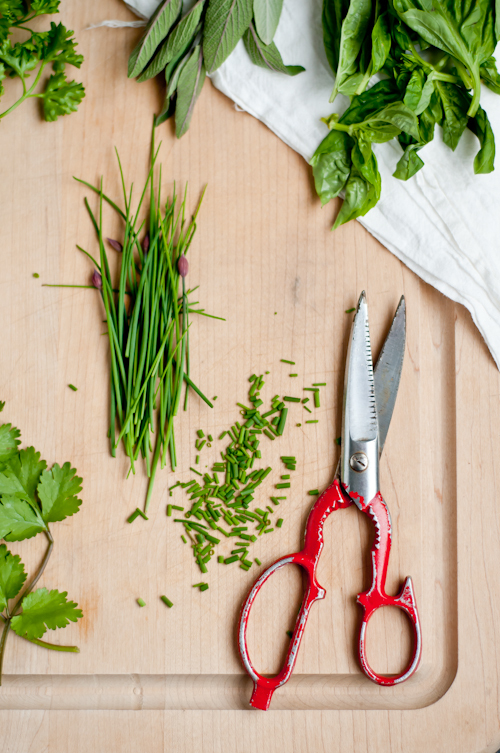 Skip the knife when you’re chopping smaller amounts of herbs and snip them into little bits. You’ll be amazing at how quick this is. Other ways to use the shears over a knife? 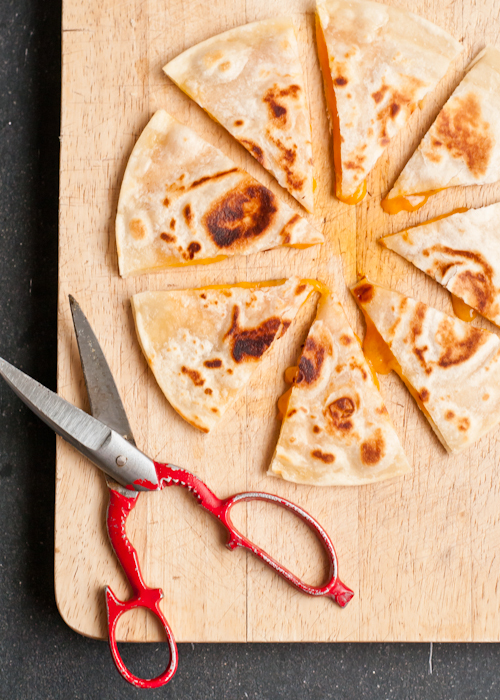 Cutting tortillas and quesadillas is very easy with kitchen shears. So is cutting chicken into pieces. It’s easier to snip homemade candy like caramels, marshmallows and taffy into bite size pieces. Kitchen shears are also great for snipping dried fruit into bits, as well as cutting raw or cooked bacon into small pieces or trimming fat from meat. The last one is another favorite tip that I use all the time. My family likes roasted root vegetables quite a lot. We eat them on a weekly basis. It can take a very long time to wait for the oven to heat up and then for the veggies to roast until they are tender enough to eat. 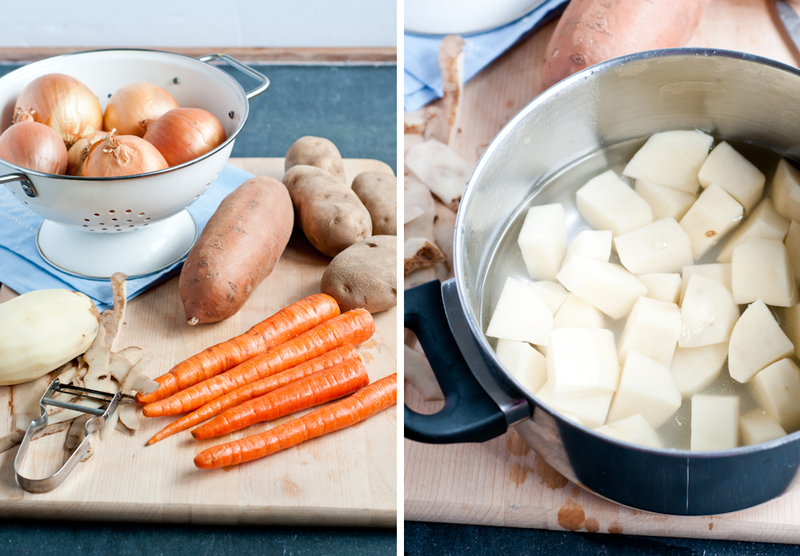 Shortcut #10: Parboiling the vegetables cuts the time in half! Toss the veggies with a little olive oil and stick under the broiler to finish them off. You’ll wonder why you ever did it any other way. Similarly, you can also microwave diced onions to help them soften and caramelize more quickly, then finish them off in a skillet. Okay lovely Design Mom Readers, I’ve shared my favorite cooking shortcuts. Now, what are your favorites? P.S. — You can find all of posts in the Living Well series here. 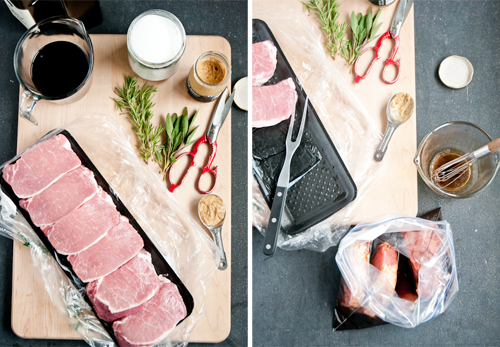 Love this post and I’d looooove to have the recipes you use when freezing chicken and meat! Herbed Balsamic (good for chicken , pork and beef). You don’t have to put it in the slow cooker, but it is also good that way. 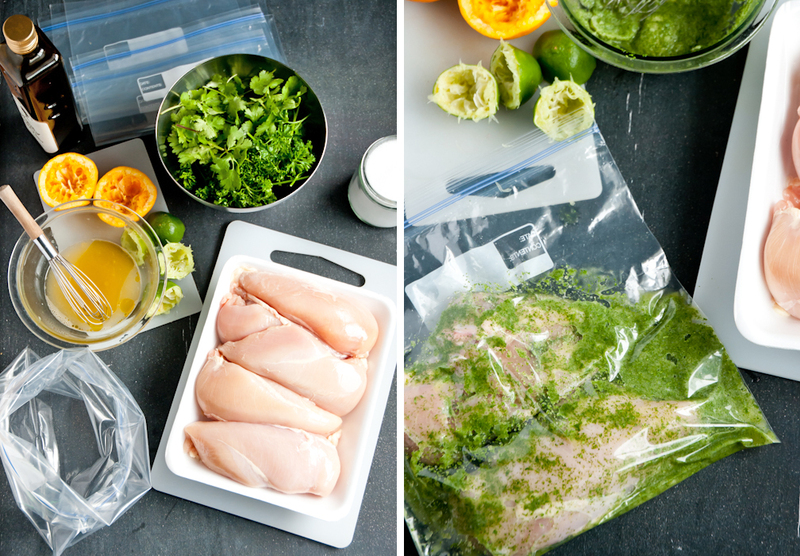 The cilantro citrus recipe shows bone-in, skin-on chicken, but we use it for boneless, skinless chicken too. Either way. It’s one of our very favorite marinades. I have made the slow cooker pork – it is amazing!!! My whole family loved it! Thank you Andrea! I’m so glad you enjoyed it! A lot of good tips. I would just suggest that you be sure to eat some fresh un-cooked fruits and veggies at every meal. Freezing them kills all of their helpful enzymes. We sure do! Thanks for adding that in. We often have a big salad to go along with dinner and every day for lunch. :) It’s important to get those fresh veggies and fruit in every day. Freezing doesn’t “kill” enzymes. Enzymes aren’t alive, so they can’t be “killed”. Freezing food changes the cellular structure (cell walls busting – just like chewing your food), but it doesn’t actually change the molecular structure. Long term (years) freezing can start to denature enzymes so they will be less effective, but they would still be there and still be “active”. That’s not to say fresh foods aren’t better – phytonutrients and things aren’t researched that much. Fresh is great when you can get it, but frozen is by no means bad. I agree, it’s nice to have all these tips in one spot! We had an abundance of parsley last year in the garden, but we just froze it in water instead of olive oil. This year, with many more herbs growing, we’ll have to be more efficient! The DIY garlic jar is a good idea, especially since we use garlic so often in our cooking. Thanks! Last year I posted about drying herbs–might help with tackling the abundance of herbs. I’m planning on planting more too! I so need a pair of kitchen sheers – feel like I’ve been saying that for years. And I honestly don’t know why I never thought to prepare my own garlic. The bottled minced garlic that I so often use is no comparison for fresh. And garlic you chop yourself totally tastes better! I compared them side by side and there is no comparison. You’ll never go back. I love kitchen shears too – I even use them to cut pizza. Also, a question about garlic: is there any reason you can’t freeze it in cubes like the ginger? If so, with or without oil? Have you (or anybody else here) tried that? I have recently bought some garlic frozen that way. I believe I bought it at Trader Joe’s or Whole Foods. It came in a mini cube tray and was frozen. Each cube was equal to 1 clove of garlic. There are no added oils or anything to it. They also sold Basil and ginger this way. I purchased them with the intention of once they are used up I will refill them with my own fresh garlic. Great idea! I’ve seen those as well. After trying out a bunch of different kitchen shears, my mom bought me these. They are absolutely amazing- I use them several times a day- in the kitchen and also for fabric and just about anything. I think I’m going to need to try the parboiling and roasting trick! Question- how do you know when to move them from the pot to the broiler? I boil them just until they are almost tender–like they would taste too raw if you were to eat them straight from the pan, if that makes sense. They go under a low broiler for about 5-8 minutes depending on how far away the pan is from the heat element. I cook my root vegetables about 1/2 done in microwave then remaining time in under the broiler. This article was glorious! My favorite time saver is when a recipe calls for shredded chicken, put the cook chicken in a bowl and use your hand blender! You can shred pounds of chicken in about 5 seconds! Throw the beaters in the dishwasher and done. these are so great!! all hail the ice cube tray!!! and i am so with you about the scissors, i use them to chop canned tomatoes right in the can. Molly! That is an invaluable tip! I’m going to start doing that. I usually use my immersion blender, but then I have to take it apart to wash it. Wahoo! Thanks for sharing that! I usually have a bowl or some kind of pot in the sink. I fill it with water, add a few drops of dishwashing liquid, stick the immersion blender in and turn it on. If I can put it in a pot of soup, I can put it in a pot (or bowl) of soapy water. Rinse and done. What a great post! I love reading tips like this! Also – great photos! With kids I have learned to use my pizza cutter for quesadillas and pancakes- so easy! Love it! We use a pizza cutter sometimes too, but never thought about using it for pancakes. That’s going to make three little kids very happy the next time I made pancakes. Great tip, Shauna! Love the tips! I love my kitchen shears, too! One thing I use them for is cutting up bowls of cooked spaghetti for my toddler, right in the bowl with the sauce already on (so the noodles don’t stick to the shears). It’s quick and helps my little guy eat more independently. Love this tip! Wish I had thought to do that when my kids were tiny. Great tips! I like to buy chicken in bulk, grill it all at once, and freeze the cooked chicken in bags of 2 or 3 breasts. Then if we want quesadillas or grilled chicken Cesar, or wraps, or whatever, the chicken is already cooked and ready to go. I do this with ground beef too. Cook it first and then freeze – good for tacos, soups, whatever. You can add the steak and marinade to a bag and freeze. What great tips! I just pinned almost all of them. I always have trouble figuring out what to do with leftover wine. I have never thought of freezing it! Great tips! Using olive oil for frozen herbs instead of freezing them in water (which is a tip I see a lot) is genius! One question, though. Isn’t there a concern about botulism when storing minced garlic in olive oil in the fridge? 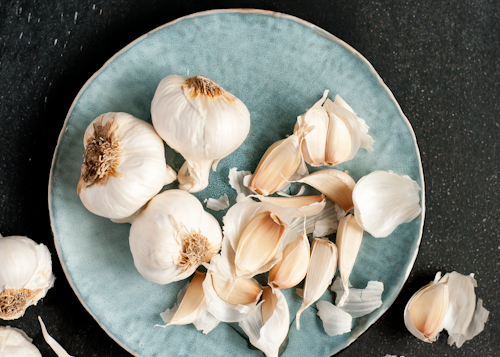 I heard somewhere awhile back that you should only store fresh garlic this way for about 24 hours, otherwise you risk the growth of harmful bacteria that thrive in anaerobic environments. The jarred stuff from the store is treated somehow to prevent this (and thus doesn’t taste as good as fresh). Anybody know if that’s true or how long we can store fresh garlic in olive oil in the fridge? Thanks for the great kitchen tips! Jessica, thanks for bringing this to my attention! I just researched this for a few minutes and you’re right. There is a risk of botulism from garlic in olive oil. I personally have not had any illness from doing this, but I don’t keep it in the fridge for a very long time either. It seems like the best thing for longer term chopped garlic storage in olive oil is to freeze it as with the chopped herbs in olive oil. I don’t want anyone to get sick! Another thought I just had. You could saute all the garlic first too and that should help if there is any botulism hanging around on the cloves. Man, I’m glad you brought this up! I hadn’t heard of this until now. Hi there, I love the tips, and I am definitely going to try freezing fresh herbs in olive oil. Regarding garlic, I’m Indian and Indian food requires garlic in almost everything, so I hate peeling away garlic shells all the time, almost everyday! What I do is, I peel a batch, not too many, maybe two or three garlic and store them in a little glass jar in the fridge. They’ve lasted a week for me. And then I just use the mortar and pestle to mash, as and when I require them. Hope this helps! wonderful ideas! I love using frozen chopped onions (in the frozen vegetable aisle at your local grocery store). Chopping fresh ones gives me extreme eye irritation, and being able to just use the amount I need and then put the rest back in the freezer has saved many recipes. Cooking dried beans in bulk and then freezing them changed how I made dinners. I am not a good cook so I am always looking for ways to improve and save time in the kitchen. Loved this post! Great tips! I’m definitely going to try freezing sauces and soups. Seems like it’d be such a time saver. Amazing photos too! Garlic in oil can cause botulism if stored for too long ! Otherwise, wonderful tips :) Thanks! Thanks for the link to that Camille! Thanks for these great tips. Here’s what I do with ginger: I peel the fresh root, cut it into 1 inch pieces, and then freeze those. Then when a recipe calls for frozen or grated ginger, I chop or grate that frozen piece. It’s much easier to grate frozen and not at all hard to chop. Also, and I hope this is constructive criticism: I really like your posts but I often feel like they’re overwritten. I don’t think you need to spend 3 paragraphs reiterating how busy life can be, how fast paced our society is, etc. Just get to the point. Great tips! Instead of going to all that work with ginger, I just keep a large piece of it in the freezer. When a recipe calls for it, I just peel a little part of the skin off with a spoon and then use a microplane to grate what I need. That’s a great idea too! Thanks, Heather! WHAT?!?! My mouth kept dropping open more with each tip I read. Seriously, love. This is my favorite Living Well post you’ve ever written. I know all about freezing things in ice cube trays but why have I never thought of extra wine? And ginger? And herbs with olive oil instead of water? And microwaving or par-boiling before roasting? Freakin’ genius. I am an avid reader of this blog, but it is my first comment… This tips are particularly helpful as we always need more time for other things! Thanks for such a lovely blog and for always inspiring subjects! Thanks for the tips! I specially love the wine ice cubes solution – that’s fantastic! Great tip Iren! Homemade pizza is so good and that makes it even easier to enjoy. We use a pizza cutter to cut up our daughter’s pancakes and french toast as well as quesadillas. Now whenever we’re out for breakfast my husband always complains how much of a hassle it is to use a fork and knife to cut them up. It sounds silly, but it’s a huge help! 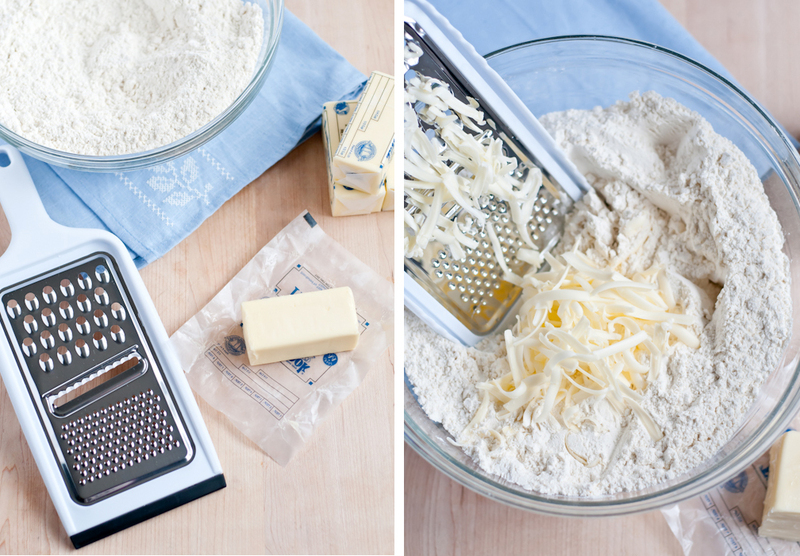 …many thanks for the ‘grate’ butter tip – especially useful for making shortbread and scones! My grandpa always cut pizza with scissors and I loved it! We also use the shears to cut up pizza or meat for little ones. No more making a jillion cuts to get it small enough for little mouths. Instead you can just pick it up and snip snip snip! AMAZING post! Beautiful pictures too! Loved it! Love this post! Since I had my second daughter 8 months ago I’ve started trying to find shortcuts in the kitchen. It’s so helpful!!! For my ginger, I shave the skin off, cut it in 2-3 inch chunks, double bag it and throw it in the freezer. That way I can just take it out and grate it with my microplane when I want a little in a stir fry or something else. The root vegetable and wine tips will be my saving grace. I try to avoid all recipes with wine for that exact reason! 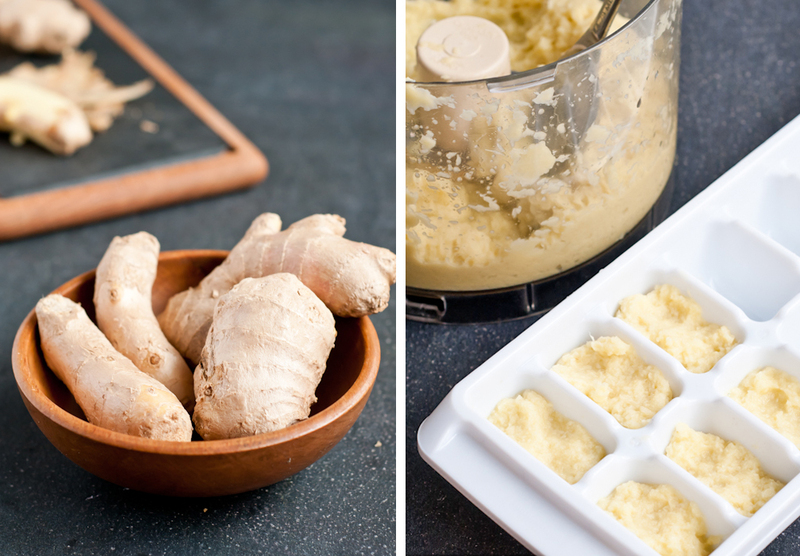 I love all the ice cube tray ideas–one other thought for ginger–I just keep the whole piece of root wrapped in plastic in the freezer and when I need some grated ginger, grab it out and give it a few quick runs over the micro plane. It grates much easier when it is frozen hard and also keeps much longer. Thanks for all your tips! Great tips. I agree with the onerous ginger prepping. My tips is similar except that I put mine through a vitamix (blender might work?) and purée the hell outta it then use small cookie scoop or Mellon ballet to measure out (close to) a teaspoon. Lay them on a cookie sheet, freeze, pop them off, stick them in a Baggie and freeze till needed. Voila! For tip one, I have started laying my chicken breasts or thighs on a cookie sheet lined with waxed paper and putting them in the freezer. Once they are frozen, I pull them out and put them in a freezer bag. This way they don’t all stick together. Also, I just wanted to mention I have those exact kitchen shears with a teal handle and I love them so much! Smoothie packs are such a great idea, but I have a hard time finding a blender that’s quick and not noisier than a jack hammer! I never ever finish a whole bag of spinach so I do the ice cube thing with it. 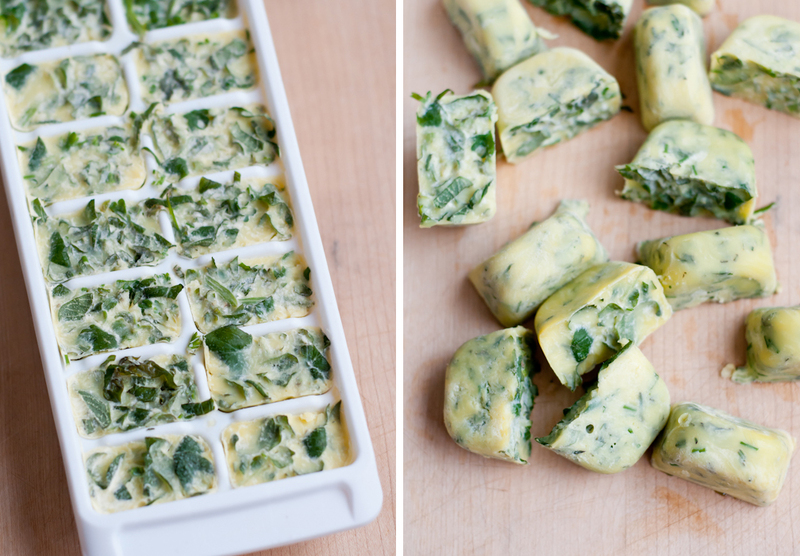 It’s great to throw spinach cubes into a smoothie, pasta sauce, casserole etc! these are all great ideas, what are some of your favorite marinades? Genius. My didn’t I think of these. I’ll be making herb and olive oil cubes with the kids tonight! This really isn’t a cooking tip, but I wash all my “baggies”, except those used for meat, and reuse them over and over. Saves lots of money. Also if I freeze something on a cookie sheet for freezing, if it’s something juicy I put them on a sheet of parchment paper. Thanks for all the tips. I have a massive and I mean massive amount of broad leaf parsley growing so i grab huge bunches place in resealable plastic bags toss into freezer later when parsley is required just open bag and crumble your needs reseal toss back into freezer. have done this with a number of herbs. Take left over bread, cut into squares for croutons . Shake out whatever you need put into another plastic (produce ones) bag add some olive oil herbs . shake the bag. 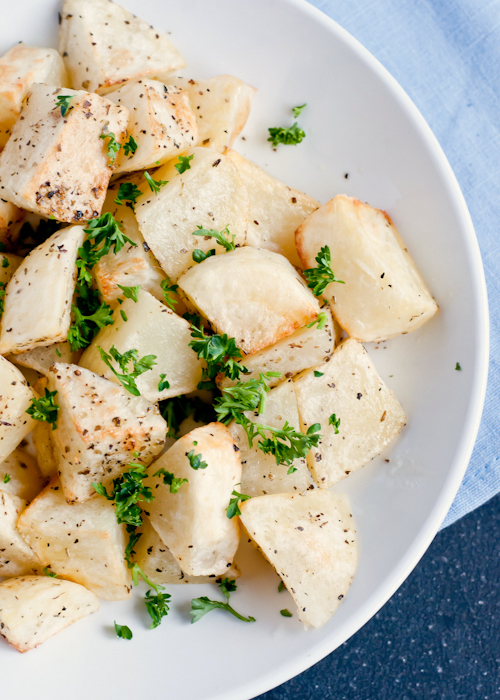 put in the oven for 20 minute at 350 and have fresh croutons for your salad… toss the produce bag. done. You can also start baked potatoes with fifteen minutes in the microwave. By the way, I just found your site today, and I gotta say I love it! I just moved out of my parents place, and it’s super helpful having a replacement Internet mom for help in the kitchen. 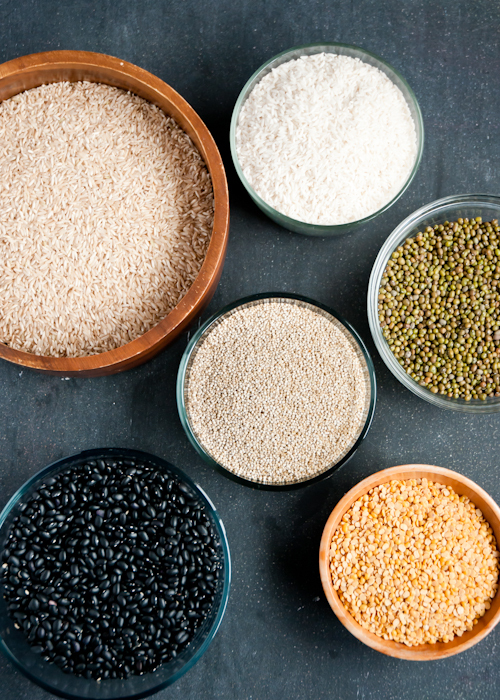 Your articles on vegetable basics have been particularly useful ^^ thank you! 10 Shortcuts for Better Cooking. Like freezing fresh herbs in… | bingoa !